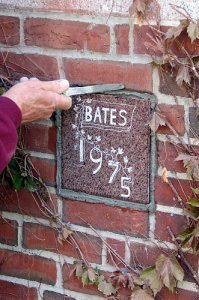 Thirty-one years ago, the Class of 1975 graduated from Bates without giving an ivy stone to the College. The Class of ’74, too, had left Bates without partaking of a tradition going back a century. Why? By the late 1960s, Ivy Day had devolved (or evolved, from a student perspective) into a raucous student-only gathering in the Chapel featuring savage wit and satire. Call it a compressed version of Mayoralty, the ’50s student megablast, or a Bates version of the Dean Martin roast of a few years hence. And the tone was, given the era, anti-establishment. Subsequent editions upped the ribald quotient, and, not surprisingly, Ivy Day eventually went on hiatus. The linked tradition of installing a class ivy stone limped along with little fanfare, and even that tradition skipped two years, 1974 and 1975. The ivy concept was later resurrected and thrives today in the form of a conclusion to a sober and spiritual Baccalaureate ceremony, in which the class plants an ivy and unveils its stone. But ’75 never forgot, and in 2005 the class celebrated its 30th Reunion by giving an ivy stone to the College. Designed by Diane Kounkoulas Peterson ’75, the stone arrived over the winter and on May 4, 2006, Bates head mason Wilfred Chouinard installed the plaque. Chouinard, a third-generation mason of French Canadian heritage, has installed ivy stones since arriving at Bates in the 1986. 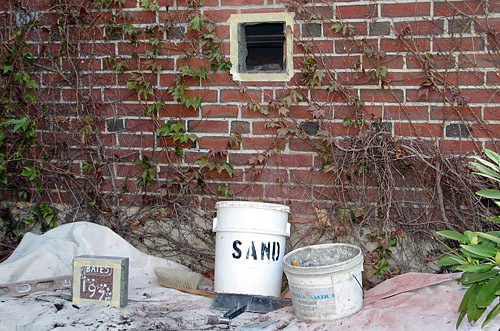 “I’m very particular,” he said, shimming the stone and checking it with a level before applying more mortar.